On Sunday, April 9, 2017 at 3 pm at the Purchase College Performing Arts Center, the Philharmonic welcomes the Kalichstein-Laredo Robinson Trio. 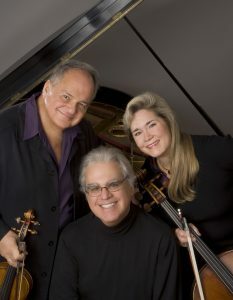 The “KLR” Trio, arguably the finest ever of its kind, includes the Philharmonic’s own Principal Conductor violinist Jaime Laredo along with his with wife, cellist Sharon Robinson, and famed pianist Joseph Kalichstein. Four decades of success the world over, including many award-winning recordings and newly commissioned works, the Kalichstein-Laredo-Robinson Trio dazzles audiences and critics alike with its spectacular performances. Since making their debut at the White House for President Carter’s Inauguration in 1977, the trio has set the standard for performance of the piano trio literature. To honor the monumental 40-year collaboration of this incredible trio, the orchestra presents a trio of works by monumental composers. First, Mozart’s Piano Quartet No. 1 in G minor, a gorgeous chamber work, will feature Philharmonic violist Jessica Troy. Bach’s glorious Brandenburg No. 5 features Philharmonic flutist Laura Conwesser and the concert closes with the ultimate compositional achievement for trio and orchestra, Beethoven’s Triple Concerto. This entry was posted in Press Releases and tagged Bach, beethoven, classical music, mozart, orchestra, performance, philharmonic, symphony. Bookmark the permalink.